UNICRI, in collaboration with the Tanzanian National Institute for Medical Research (NIMR), the Italian Medicines Agency (AIFA) and the Bambino Gesù Pediatric Hospital, has organized a training course on respecting ethical principles and justice while conducting clinical trials in developing countries. 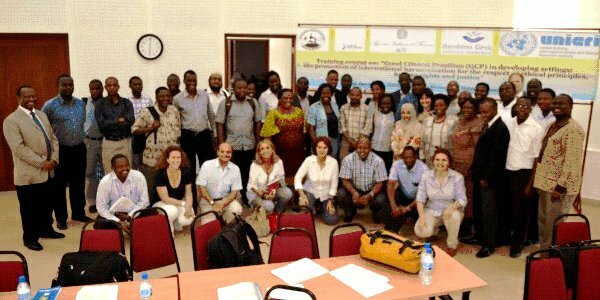 The course, entitled "Good Clinical Practice: the promotion of international harmonization for the respect of ethical principles, human rights, and justice," was held in Mwanza, Tanzania, from 11-14 June, 2012. The course aimed at increasing the expertise of officers and professionals working in the field of pharmaceutical clinical research with human participants and strengthening knowledge of ethical, scientific, and regulatory aspects of Good Clinical Practice Guidelines. The course included lecturers from prominent universities and research institutions in Africa and officials from African and European pharmaceutical regulatory agencies. The Permanent Secretary of the Ministry of Health & Social Welfare delivered a message at the opening of the course. The course took place across four days, with each day divided into a theory and a practice session. The theory sessions were dedicated to all trainees, while the practice sessions saw the groups divided into two parts: the first was the Investigators, Assessors, Ethics Committees and Regulatory Group, while the second was the GCP Compliance Group. The course has laid the groundwork for establishing an African-European network of professionals trained in the international standards of clinical trials. Further action will include the delivery of the training modules to other professionals in Tanzania and eventually to other countries in the Region. UNICRI received very positive feedback on the organization and the contents of the course, and is planning to prepare in collaboration with NIMR a web-based course to make course materials permanently available to professionals in the country.